Liftmate Direct is a web based division of Lomart Ltd.
We are located in North London, but supply all of UK & Ireland and we welcome export enquires. LiftMate is an international brand and a UK and EU registered trademark with a number of agents and re-sellers worldwide. 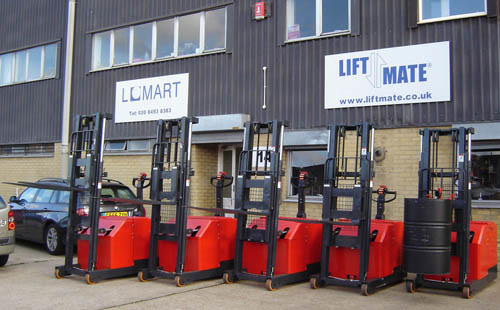 Lomart Ltd has been selling LiftMate hand pallet trucks, materials handling and warehousing equipment in the UK since 1991. Quality and reliability are at the forefront of our company philosophy and that is why we carefully select and test all the machines in our portfolio. All our trucks and stackers comply with CE requirements and are guaranteed for either 12 or 24 months. Spare parts for our products are always available. All applications have their specific requirements. In order to meet your materials handling needs, we offer one of the widest ranges of pallet truck and trolley sizes, capacities, wheel combinations and various other options available in the UK. If you cannot find what you are looking for from our stock of over 2000 machines, we will be happy to design and make the right product for you. To see our full range of pallet trucks please visit www.pallettrucks.co.uk.